The StarLite GX is a complete measurement system that provides manual stage motion with programmable Field of View measurements in all three axes. 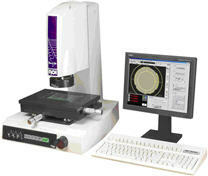 The StarLite GX optical measurement system accommodates parts up to 6" in length. Its high-resolution color camera and superior optics deliver accuracy for demanding metrology applications. The StarLite magnification ranges from approximately 34x to 176x. The StarLite has a built-in controller which is powered by eGx® software running on a customer or distributor-supplied computer. LED lights are provided as standard for profile and full-ring LED VectorLight. LED thru-the-lens surface lighting is optional. Accuracy specification applies to thermally stable system in rated environment, maximum zoom lens setting, and evenly distributed 10 lb load, where L is the distance in inches. XY axis artifact: QVI 25 intersection grid reticle at standard measuring plane. The standard measuring plane is defined as a plane that is 1” above the work table. Z axis artifact: QVI step gage. StarLite GX system includes cast aluminum base (10”x12.5”x1.5”) with front-mounted Z-Axis positioning control, 9”x13” precision measuring stage with 6”x3”x5” travel and coarse & fine manual positioning control, 6:1 powered zoom optics, LED bottom light and unique LED VectorLight ring light, and high-resolution color camera. The system is provided with eGx™ Software. eGx is dimensional metrology software designed specifically for video measurement systems with manual stages. With an extensive array of measurement tools, including the CompuFocus™, Motorized Zoom, intelligent edge detection, user friendly icons and a point and click interface, eGx makes it simple for everyone to get accurate, repeatable measurements. eGx software includes support for both the Classic user interface and the high resolution Single Monitor User Interface (SMUI). Dual Monitor support is optional. A Field of View calibration reticle is included, along with Z axis measuring range of 5”. Specifications include Intel Dual Core processor, Intel chipset motherboard, 1GB RAM, 80GB or larger SATA Hard Drive, 10/100 Networking, Windows XP Professional. Monitor, keyboard and mouse are not included. 20” LCD monitor, keyboard and mouse. *Customer may supply their own PC configuration as specified by RAM. For the north USA states of MO, KS, IL, IA, NE, installation/calibration/certification is included. Travel & Expenses at cost, portal-portal from Tech center location, $125.00/hour. One day eGX software training at a B.C. MacDonald & Co. tech center which includes Metrology Center, Lisle, IL. Optional onsite training.